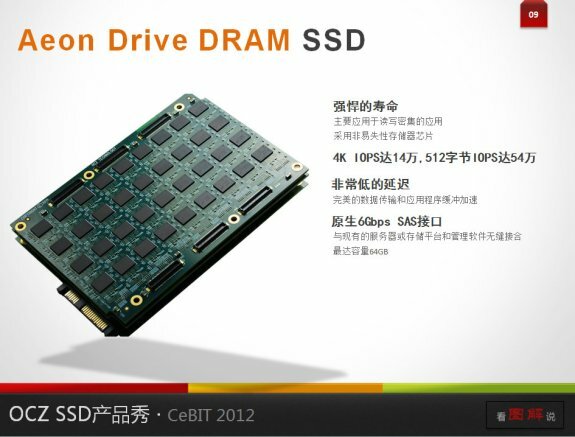 TPU also found details about the OCZ AEONDrive, a solid state disk that uses DRAM as its primary storage medium. The device is designed for datacenters, but will only be available in relatively low capacities such as max 64GB. The device is thus ideal for those parts of the datacenter which hold "hot data". Unlike similar solutions such as FusionIO drives, the AEONDrive utilizes SAS 6 Gb/s interface. SAS is a low-overhead protocol since it allows exchange of larger numbers of simultaneous host commands than ATA. As for the performance OCZ claims the AEONDrive provides 140,000 IOPS 4K, and 540,000 IOPS 512. Since DRAM is a much lower-density medium than NAND flash, one should expect AEONDrives to be available only in relatively low capacities such as 64 GB (still big enough for plain databases).